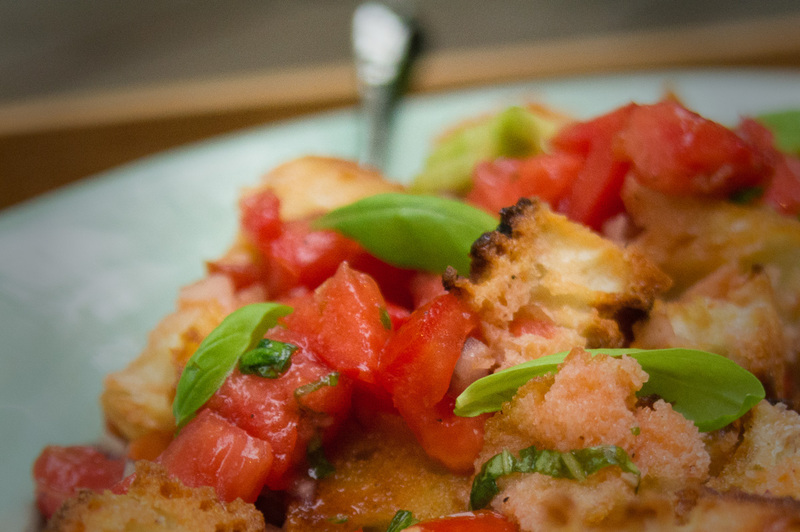 Panzanella is a tuscan tomato bread salad from the land of endless summer. If you like tomatoes and you like bread you owe it to yourself to try it at least once. Where I live tomatoes are trucked for miles in winter. I think they’re tomatoes. That what the sign says. The taste says nothing. Nothing. Dust. In summer though, picked at the peak of ripeness from nearby farms the tomato is a magical thing. For me, it just screams summer and I work them into almost every meal for as long as they last. I’ve lifted Judy Rodger’s bread technique from her fabulous Zuni chicken with bread salad. This extra step pushes it right over the top. 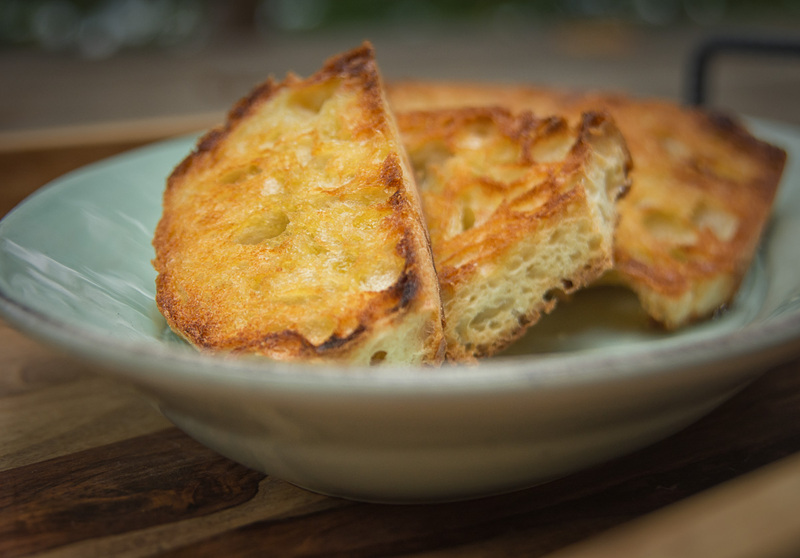 Get some good crusty bread, slice it fairly thick, brush it liberally with olive oil and toast it under the broiler. 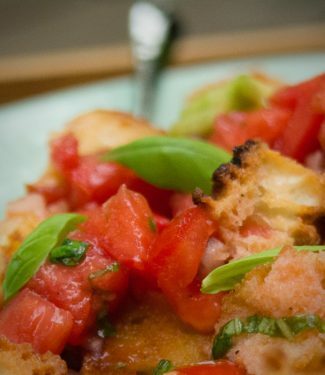 There are two stars in panzanella – tomatoes and bread – so please use a nice open crumb sturdy white bread. You can mix the bread in to soak up the tomato goodness or, if you want something a bit more formal (and to hit your guests over the head with how good the bread is) then dress the salad and top with the bread. This dish gives you a good reason to break out that super high end olive oil you’ve been hoarding. Panzanella is a truly great summer salad. Brimming with tomato and basil good bread it makes a great side dish to almost anything. Slice the bread. Brush with olive oil until completely coated. Broil, rotating your cookie sheet regularly until golden brown. Flip the bread and repeat. Watch it constantly. It goes from golden brown to black in almost no time. Let the bread cool and tear it into one inch pieces. Seed and dice the tomatoes. Peel, seed and dice the cucumber. Combine tomatoes, cucumber, onion and basil into a bowl large enough to accommodate the bread as well. Season the tomato mixture with salt and pepper. Taste to see if you have it where you want it. Add more if needed. Combine olive oil, garlic and red wine vinegar to make a simple dressing. Toss tomato mixture with dressing. Add the toasted bread and mix. Garnish with a bit more basil. Or sprinkle the bread over the tomato mixture. Work it in a bit to get some dressing on it but keep the top dry. Enjoy and try not to think about the fact winter is coming. In appetizer, italian, main course, salad, Vegetarian. Bookmark the permalink.